For a decade the loss of the Supersonics has left a void in Seattle. The franchise that helped define the culture of the Puget Sound by inspiring generations of athletes, artists, musicians, educators and business people alike has been missing. On Friday night, for one brief moment it came back…in a way. 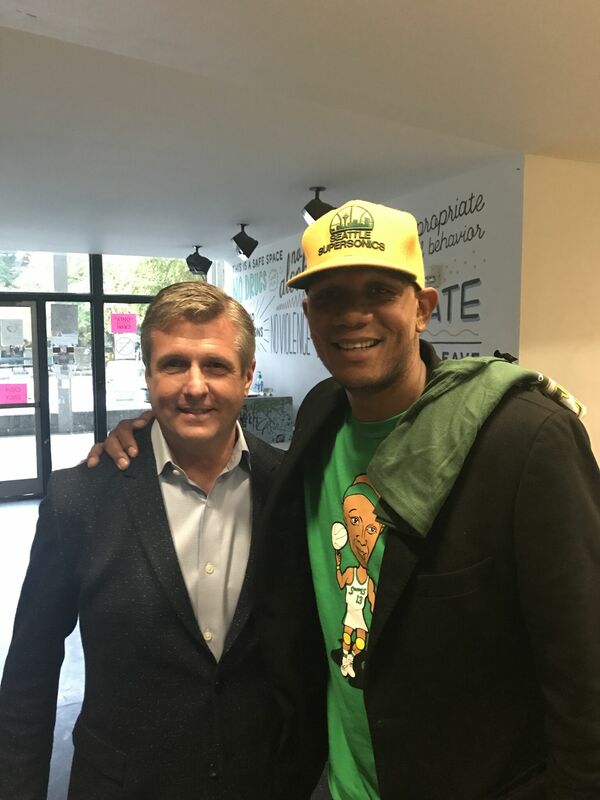 Walker was speaking at a reunion of former Sonics players and their families that was held on the Seattle Center campus hours before tip off of a pre-season contest between the Golden State Warriors and Sacramento Kings. At the same party was Golden State Warriors president Rick Welts. Welts, who began his career in the NBA as a ball boy for the Sonics in the 1960’s, rose through the ranks of the NBA and was enshrined in the Naismith Hall Of Fame for his storied career. He was one of the biggest driving forces behind the game taking place in the Emerald City. “I was on top of the Space Needle this morning and was looking out towards Queen Anne Hill,” Welts said to the gathered Sonics alumni, many of whom he worked with as a young boy. His memory led Welts right back to the moment at hand and the importance the Supersonics had on another young man who’s NBA career started in Seattle. Durant, who was drafted by the Supersonics and spent his rookie season with the franchise made it clear just how excited he was in the lead up to the game. He posted on social media four different player exclusive Nike shoes that he planned on wearing before, during and after the contest. One day prior to tip off local media and businesses made the return of NBA basketball the talk of the Emerald City. Slick Watts and James Donaldson kicked things off with an appearance on King 5’s New Day Northwest where they discussed the impact of the Supersonics on the community as well having a candid discussion about the importance of mental health with particular regard to competitive athletes. The same evening saw Gary Payton make an appearance at Simply Seattle in Pioneer Square. The Glove, one of the most outspoken proponents of a return of the NBA to Seattle, spent the evening signing autographs and meeting fans who lined up around the block to meet the biggest star in Supersonics history. By the time game day arrived the city was in a basketball frenzy. Having witnessed the Seattle Storm win their third championship less than a month prior, the city turned out in force to celebrate another momentous occasion in its storied basketball history. As the @seattlestorm showed, basketball never left Seattle. Storm stars Sue Bird and Breanna Stewart were joined court side by Sonics Legends Lenny Wilkins, Fred Brown, Spencer Haywood, Detlef Schrempf and Payton. Seahawks stars Bobby Wagner and Russel Wilson sat nearby. Platinum recording artist Macklemore also had a place of prominence. The best seat in the house was reserved for the greatest winner in basketball history, former Sonics coach Bill Russell who sat at center court. Elsewhere throughout Key Arena other Sonics and Seattle basketball icons including Jack Sikma, Jamal Crawford, Doug Christie and Spencer Hawes showed their appreciation for what the NBA and the Supersonics meant to them. Then, for the first time in a decade it was time for NBA basketball in Seattle. The Kings’ starters were announced to mild applause from the sellout crowd. Then came the Warriors. There was a loud cheer when Washington State Alumni Klay Thompson was announced but it was Durant that brought the 17,072 to their feet. As he was announced to the crowd he tore off his Warriors warmups to reveal a Shawn Kemp jersey. The roar from the fans was deafening. At the end of the night, after Durant posted 26 points, 7 assists and 6 rebounds and Thompson put up a casual 30 points including 5 first quarter 3’s, the crowd of Sonics faithful were left with bitter sweet feeling. The NBA was once again leaving the city. The arena that housed it for most of its 41 years is shuttered for at least the next two to undergo a $700 million+ renovation in hopes of luring the Sonics back. The questions that linger in everyone’s minds as the final buzzer sounded were the same as they had been for a decade. How long before the NBA is back in Seattle? How long before the Supersonics, a franchise that in so many ways defined a region and shaped modern basketball is returned to its rightful place in the Emerald City? Now, just as everyday for the past 10 seasons those questions will gnaw at the void in Seattle basketball fans’ hearts, but for one glorious night, they and the world were reminded just how Super the Sonics and Seattle are.